We’d love your help. 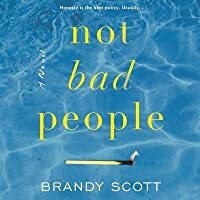 Let us know what’s wrong with this preview of Not Bad People by Brandy Scott. A clever, compelling debut novel with a unique premise of what happens when three best friends engage in what seems to be a harmless act, but instead results in tragedy, leading the women to confront buried resentments, shattering secrets, dark lies, and the moral consequences that could alter their lives forever. Three friends, thirty years of shared secrets, one impulsive A clever, compelling debut novel with a unique premise of what happens when three best friends engage in what seems to be a harmless act, but instead results in tragedy, leading the women to confront buried resentments, shattering secrets, dark lies, and the moral consequences that could alter their lives forever. Aimee is convinced their little ceremony caused a major accident. The next day, the newspapers report a small plane crashed, and two victims—one a young boy—were pulled from the wreckage. Were they responsible? Aimee thinks they are, Melinda won't accept it, and Lou has problems of her own. It's a toxic recipe for guilt trips, shame, obsession, blackmail and power games. To ask other readers questions about Not Bad People, please sign up. Brandy Scott is a radio presenter and a journalist, who has embarked upon a new career as a novelist, releasing her debut contemporary fiction piece, Not Bad People. With an open-ended title, it got me thinking about the whole concept of what constitutes as being a ‘good’ or ‘bad’ person. Sometimes the lines and moral boundaries are blurred, thanks to the various situations, or binds we find ourselves in. In Not Bad People, three friends from a small Australian town find their lives irrevocably changed one fateful New Year’s Eve. I am defining Not Bad People as a slow burn style life lit novel. This novel contains a set of characters who are the type of protagonists drawn from real life personalities, or have parts that we can see in ourselves. I know there were many situations faced by these thirty-something women that I was able to relate to. I also have the feeling that the teen based issues experienced by the children of the women in the book will be sure to strike a chord in a few years time, when my own children hit their teens! What a melting pot of complications, problems and tensions! *Please note that a free copy of this book was provided to me for review purposes through Beauty & Lace and Harper Collins – AU. This book started off slow for me and I found myself easily confused with all the different going back and forth between all the different people. I skimmed through several chapters so for that reason I’m giving it 3 stars. Not sure why I couldn’t stay focused throughout and it took me a long time to get through it. It was just ok for me. There's nothing better than reading a story and starting to feel as though you actually KNOW the characters, finding yourself saying, "Girl, I understand how you feel." This book takes place in a small town in Australia, smack dab in the middle of a thirty year friendship between three women. And these women are so easy to identify with in so many ways. You read about their lives, their families, and their history together. You learn their fears, their desires, their neurotic I LOVED this book. This is one of those books which you wish would never end, while at the same time racing to get to the finish, to find out how it all works out. I found myself longing to get back to the characters every time I had to put the book down. Brandy Scott’s debut novel is quick-paced, funny, poignantly truthful, and full of surprises. Above all, it is extremely readable. Her characters (and she gets into the heads of a lot of them) are realistic in their flaws, and without being stereotypical they are This is one of those books which you wish would never end, while at the same time racing to get to the finish, to find out how it all works out. I found myself longing to get back to the characters every time I had to put the book down. Brandy Scott’s debut novel is quick-paced, funny, poignantly truthful, and full of surprises. Above all, it is extremely readable. Her characters (and she gets into the heads of a lot of them) are realistic in their flaws, and without being stereotypical they are the people you meet every day. They are relatable. A favourite aspect of this book for me was Brandy Scott’s ability to speak from the view of so many different characters, an important aspect of the clever and multi-faceted plot, and brought to life one of the themes running through the story – that not everything is at it seems to someone else. I was borrowing a copy but it was so good I went and bought my own - and a copy to give to my sister. Yes, it’s that good. This review has been hidden because it contains spoilers. To view it, click here. I enjoyed this story and the different perspectives it offered of the aftermath of a plane accident in a small country town. Scott's story revolves around three normally flawed women, their friendships and their relationship with their hometown. She cleverly drew out the characters' different personalities, their issues, their histories and their issues. I was going to give it four stars, however I felt that the ending was a bit sloppy in lots of ways in terms of expression and also character dev I enjoyed this story and the different perspectives it offered of the aftermath of a plane accident in a small country town. Scott's story revolves around three normally flawed women, their friendships and their relationship with their hometown. She cleverly drew out the characters' different personalities, their issues, their histories and their issues. I was going to give it four stars, however I felt that the ending was a bit sloppy in lots of ways in terms of expression and also character development. I couldn't help but think that the way in which the character Miranda was 'wrapped up' was a bit too neat. I think it would have been a stronger story if Miranda found herself pregnant and without her business, or alternatively not pregnant and implementing her strategy to keep her business. To have both seemed a bit too neat. Also, the constant switching of perspectives employed towards the end was just a bit much. Just as you got into the swing of one voice, you were swapping towards another. This sudden increase in pace detracted from the good pacing of the story up till then. I love when I start a book with no expectations about it and come out just loving the book. That is what happened to me with author, Brandy Scott's debut novel Not Bad People. This book did not feel or read like a "debut" novel but a novel from a seasoned author. In the beginning, when Aimee, Melinda, and Lou were hanging out writing their wishes for a new year to send off in the lantern ceremony, I was not a fan of any of the three women. However, shortly after I was a little ways into the stor I love when I start a book with no expectations about it and come out just loving the book. That is what happened to me with author, Brandy Scott's debut novel Not Bad People. This book did not feel or read like a "debut" novel but a novel from a seasoned author. In the beginning, when Aimee, Melinda, and Lou were hanging out writing their wishes for a new year to send off in the lantern ceremony, I was not a fan of any of the three women. However, shortly after I was a little ways into the story, I actually found myself warming up and liking the women. Actually, it is kind of funny as Aimee may have been the only one that was really concerned about the victims of the plane crash and that it was her, Melinda and Lou's fault but she was the one that I would put last out of the three women. It was Melinda that I loved the most. She was at a major crossroads in her life and it seemed that everyone just laughed Melinda off. Finally, there is Lou. She too was ready for a change and to branch out in her life but than "life" had other plans for her. There are three main characters in NOT BAD PEOPLE. Lou is a feisty single mum whose teenage daughter is causing almost as much trouble as she did My first completed book of February is the slow-burning contemporary drama NOT BAD PEOPLE by debut author, Brandy Scott. The novel is set in the fictional country Victorian town of Hensley. My own hometown, the Mornington Peninsula, gets a brief mention, so I thought it was fitting to take my copy on a trip to my local beach. It was a lovely beach read! Look, I gotta be completely honest, this isn’t my type of book. But that said Brandy is such a talent that I was totally gripped by this domestic ripper of a story. Yes, it’s for the Moriarty crowd, for those that love the hot trend right now, but it’s charming and funny, sophisticated and poignant, a new voice in this genre. The central intrigue is what exactly happened when a light airplane goes down in a small town and kills a young man – who is to blame? Our three main characters, Aimee, Mel Look, I gotta be completely honest, this isn’t my type of book. The central intrigue is what exactly happened when a light airplane goes down in a small town and kills a young man – who is to blame? Our three main characters, Aimee, Melinda and Lou, have enough troubles of their own without having to worry about whether they accidentally brought the plane down. Wow! I would call this a domestic, psychological suspense novel. It has an exceptional premise and is a thoroughly absorbing read. This is a debut?! On New Year's Eve in a small town outside of Sydney three women who have been friends for thirty years - Aimee, Melinda and Lou - have a "letting go" ceremony off of Melinda's balcony. They light the candles in sky lanterns, not realizing they've been banned for 10 years, with notes attached of things they want to let go as to start the new year fresh Wow! I would call this a domestic, psychological suspense novel. It has an exceptional premise and is a thoroughly absorbing read. This is a debut?! They light the candles in sky lanterns, not realizing they've been banned for 10 years, with notes attached of things they want to let go as to start the new year fresh. Minutes later, in the distance, they see a flare of light. Then the sound of sirens. The next morning Aimee sees the news article about the small plane crash. Immediately see believes the sky lanterns caused it. What is she going to do? Is she right? That same morning Pete, the pilot of the plane, is in hospital recovering from broken bones and presumably temporary blindness. His teenage son is in ICU in a coma. Pete blames himself for the crash. Is he right? I loved how this novel took its time so we really get to know these three women and their history and what makes them tick. They have issues. Aimee is OCD'ed out. Big time. Melinda's on a power trip. And Lou...oh, poor Lou. These are unusually deep characterizations. Brilliantly written. After the first 100 pages the subtle surprises start becoming full-blown shockers. You realize you're in for something awesome. The convoluted plot and the superb structure are amazing. The revelations will leave you short of breath. All this is a pernicious mix leading to deep, buried secrets and resentments, guilt trips, shame, obsession, blackmail and power games. In short, it's a savory taste of high-tension goodness. I loved this book! Before reading it, I heard a few people compare it to Liane Moriarty’s work, and I can see why. It has a similar style, with relatable Australian female lead characters. But personally I’d say it’s in a league of it’s own! The story is primarily told from 3 different female view points, and I was able to relate to every one of them in a different way. There’s the single ambitious career woman, the poor single mum, and the comfortable house wife. The writing is also full of so mu I loved this book! Before reading it, I heard a few people compare it to Liane Moriarty’s work, and I can see why. It has a similar style, with relatable Australian female lead characters. But personally I’d say it’s in a league of it’s own! The writing is also full of so much wit and humour; there were a few laugh out loud moments. This book seems to balance it’s different themes so superbly - at times you feel the grief, and then you can relate to the women’s struggles, and then suddenly you’re laughing again. It also wasn’t predictable at all. Towards the end, I was so keen to finish I was trying to steal any minute I could during my day to find out what happens. It was a little slow in the first half (although still enjoyable to read with the sometimes emotional and sometimes hilarious writing), but by the halfway point I was well and truly hooked. On New Year’s Eve three friends - Melinda, Aimee and Lou - let three lanterns filled with resolutions for the year to come. After they float off, there’s a bright flare in the distance. Fireworks are happening, so the ladies think nothing of it. The next day, newspapers report a plane crash with two victims, a father and his young son. Were their lanterns responsible for the tragic accident? Or was something more sinister happening? Aimee thinks they are, Melinda won’t accept it, and Lou has pro On New Year’s Eve three friends - Melinda, Aimee and Lou - let three lanterns filled with resolutions for the year to come. After they float off, there’s a bright flare in the distance. Fireworks are happening, so the ladies think nothing of it. The next day, newspapers report a plane crash with two victims, a father and his young son. Were their lanterns responsible for the tragic accident? Or was something more sinister happening? Aimee thinks they are, Melinda won’t accept it, and Lou has problems of her own. As the women battle with the truth, their lives with unfurl before them. An absolutely brilliant book! It was a release I was very excited about and I was not left disappointed. Usually the endings of these sorts of books are easy to pick up from early on. This one, however, was not. The best part about the book was how the tension seemed to build throughout. There was no point where I wanted to put it down because I was sick of the waffle in the middle. It constantly kept you on your toes, adding more drama into the mix - but real life drama, not the over the top drama you get sick off. You get sucked into each of the ladies lives, not wanting their story to end, all while hearing snippet’s of what the father is going through post crash. So well written! Would highly recommend! I'm going to start by saying that quite simply Brandy Scott is one to watch. This is a smacker of a debut, with a fabulous cast of characters and a rollercoaster plot line that keeps you guessing until the end. Meet three friends: Melina, Aimee and Lou. They have known each other since forever, but how well do they really know each other, and how do the repercussions of one decision test the very core of their friendship. Brandy Scott has created a wonderful world in NOT BAD PEOPLE, a seemingly p I'm going to start by saying that quite simply Brandy Scott is one to watch. This is a smacker of a debut, with a fabulous cast of characters and a rollercoaster plot line that keeps you guessing until the end. Three friends from childhood, the OCD Aimee, the corporate power Melinda, and the single mother Lou, celebrate the New Year by sending up Chinese lanterns carrying note cards listing the things in their lives that they want to let go of in the coming year. What follows is a methodical and steady revelation of who each of these women really is, and the fears that they each hold along the way. The reader is also treated to meeting several of the citizens of the town of Hensley in Australia, each o Three friends from childhood, the OCD Aimee, the corporate power Melinda, and the single mother Lou, celebrate the New Year by sending up Chinese lanterns carrying note cards listing the things in their lives that they want to let go of in the coming year. What follows is a methodical and steady revelation of who each of these women really is, and the fears that they each hold along the way. The reader is also treated to meeting several of the citizens of the town of Hensley in Australia, each one adds just the right touch and is an interesting addition to the story. We also get more than one thing from this book. In addition to watching this “family” of friends and town mates, we get a mystery and a courtroom drama. Every single character is flawed in some way, each one owns secrets, but they are not bad people. I enjoyed this book very much. I found the characters remarkably real; although, I can’t speak to Aimee, as I’ve never known anyone with OCD as serious as hers. Still, the characters, the situations, and the interactions ring true. I’d love to see more of this little town. While the book resolves all if the necessary threads at the end, it leaves just enough open that there is the possibility of a sequel. I’d be happy if there were a follow-up book. It would be fun to watch these characters as they move along with their lives and their friendships. I won an Advanced Reader Copy of this book in a Goodreads giveaway. I thank all involved for making this book available to me. While I appreciate the opportunity to read this book in advance of publication, all opinions in this review express my honest reaction to this book. Because I have known Brandy Scott for many years both professionally and personally, I was extremely excited as well as a tiny bit trepidatious to read her first book - would it be as good as I had hoped? The answer is a resounding YES -- 'Not Bad People' is a gripping and ripping new novel. The characters are fully formed and engaging... there is tremendous suspense that builds throughout the narrative, and I loved the supporting characters, especially Sharna at the post office. The day-to-day Because I have known Brandy Scott for many years both professionally and personally, I was extremely excited as well as a tiny bit trepidatious to read her first book - would it be as good as I had hoped? 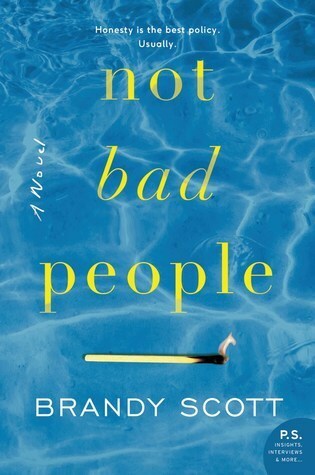 The answer is a resounding YES -- 'Not Bad People' is a gripping and ripping new novel. The characters are fully formed and engaging... there is tremendous suspense that builds throughout the narrative, and I loved the supporting characters, especially Sharna at the post office. The day-to-day issues that the three protagonists face in their personal and professional lives are relatable and compelling while the impending resolution around the major plot twist (mentioned in the book's blurb) keeps you turning pages through the night. This review has been hidden because it contains spoilers. To view it, click here. Not Bad People starts off with an interesting premise - three friends release paper lanterns filled with resolutions on New Year’s Eve. The next day, we learn there was a plane crash nearby and one of our characters is convinced that the lanterns were the cause. I thought this would be a fast-paced suspense/thriller that focused primarily on the crash and the aftermath (maybe a trial? A more in-depth investigation?) but it’s really about these three friends (Aimee, Melinda and Lou), their lives Not Bad People starts off with an interesting premise - three friends release paper lanterns filled with resolutions on New Year’s Eve. The next day, we learn there was a plane crash nearby and one of our characters is convinced that the lanterns were the cause. I thought this would be a fast-paced suspense/thriller that focused primarily on the crash and the aftermath (maybe a trial? A more in-depth investigation?) but it’s really about these three friends (Aimee, Melinda and Lou), their lives and how their friendship unravels over the course of a few weeks. It leans heavily into the Women’s Fiction genre (not a negative, just an observation). The friendship falls apart so fast I found it difficult to believe that they were even good friends to begin with (maybe their friendship is a matter of proximity rather than choice). When dealing with Aimee’s mental issues, Lou and Melinda seemed annoyed rather than worried about their friend. I also thought the author was setting us up for some sort of confrontation with Peter’s stepson, Cameron. There were also some loose ends regarding Cameron and Aimee’s son, Byron. The book was a bit longer than it needed to be - at more than 550 pages, I feel there were some storylines or repetitive parts that could be cut out. The writing is good - this is a debut from Brandy Scott and I think it’s promising. I would be interested in reading another book from her if she continues to write. Aimee, Melinda and Lou have been best friends since childhood, living in a small Victorian country town not fat from Melbourne. The three friends couldn't be more different. Aimee is the only one who is married, to Nick, with whom she runs a local vineyard. Lou is the ratbag one who became pregnant while she was still at school and struggles to make ends meet. Melinda is the shining light, the one who created her own business and could live anywhere but chooses to stay in her hometown and run he Aimee, Melinda and Lou have been best friends since childhood, living in a small Victorian country town not fat from Melbourne. The three friends couldn't be more different. Aimee is the only one who is married, to Nick, with whom she runs a local vineyard. Lou is the ratbag one who became pregnant while she was still at school and struggles to make ends meet. Melinda is the shining light, the one who created her own business and could live anywhere but chooses to stay in her hometown and run her business from there. The friends get together on New Year's Eve and each one launches a Chinese lantern into the sky along with a secret wish. In town there's also a fireworks display happening. Coincidentally a local man and his young son have embarked on a small plane ride. The plane crashes and the son dies, while the father is, at least temporarily, struck blind. Aimee, who has long suffered from mental instability, is convinced that their Chinese lanterns were the cause of the plane crash. A great book. Starts with the premise, builds characters and then, as it starts to settle and wonder where it’s going - bang - adds twists and turns. The characters are all believable as it’s easy to empathise because we all have these sides to us, easy to put ourselves in these positions and easy to see how we all make decisions in our lives which we may like to go back and change, but can’t....and the loops we turn to try and make those changes. The decisions are also believable and ultimately A great book. Starts with the premise, builds characters and then, as it starts to settle and wonder where it’s going - bang - adds twists and turns. The characters are all believable as it’s easy to empathise because we all have these sides to us, easy to put ourselves in these positions and easy to see how we all make decisions in our lives which we may like to go back and change, but can’t....and the loops we turn to try and make those changes. The decisions are also believable and ultimately this is a story showing how, despite those loops, often the smoothest path is the one we feel most uncomfortable with, and yet once taken, allows us to move forward. Not Bad People is a great read. It keeps you interested with plot twists and turns but the characters are believable and you'll feel like you either know them, or are them. They're real and they react to the unfolding events like real people, not characters being forced into actions to fit a story arc. The novel also provides an insight into small town living and explores how friendship, community, love and family can change over time - for better and worse. The book is largely told from the vie Not Bad People is a great read. It keeps you interested with plot twists and turns but the characters are believable and you'll feel like you either know them, or are them. They're real and they react to the unfolding events like real people, not characters being forced into actions to fit a story arc. The book is largely told from the viewpoint of three friends and a local man who was involved in a plane crash. It's always clear who you're following and the various povs blend seamlessly to cleverly add to the unfolding events. This is a page turner.... one of those books that has you sneaking about trying not to wake the house up at 3am looking for a torch to carry on reading with. The characters are so very easy to relate to... there’s a little of each of them in all of us and at times it is laugh out loud funny. Engagement is just not an issue... so you find yourself hooked on the characters really fast. And then you get into the multiple and perfectly interwoven story lines... I found I simply had to know what happ This is a page turner.... one of those books that has you sneaking about trying not to wake the house up at 3am looking for a torch to carry on reading with. The characters are so very easy to relate to... there’s a little of each of them in all of us and at times it is laugh out loud funny. Engagement is just not an issue... so you find yourself hooked on the characters really fast. And then you get into the multiple and perfectly interwoven story lines... I found I simply had to know what happened next, believe me you’re kept guessing all the way to the end! 5 stars! This book exceeded my expectations! True to life characters, gripping story and fantastic writing, this one was hard to put down. Many readers are comparing it to Liane Moriarty’s style, and while it will appeal to her fans, I actually thought this book was much better. Highly recommend and I will be keeping my eye on this author. This was one of those books that you start reading and keep coming back to, because the characters start to feel like your friends. You have to know what's going to happen to them. There are also many twists and turns, and dark moments, where the characters have to question themselves and the decisions they've made in life, which makes it highly realistic. If you like Liane Moriarty, this is the book for you!